The Jewish skeleton collection was an attempt by the Nazis to create an anthropological display to showcase the alleged racial inferiority of the "Jewish race" and to emphasize the Jews' status as Untermenschen ("sub-humans"), in contrast to the German race, which the Nazis considered to be Aryan Übermenschen. The collection was to be housed at the Anatomy Institute at the Reich University of Strasbourg in the annexed region of Alsace, where the initial preparation of the corpses was performed. The collection was sanctioned by Reichsführer of the SS Heinrich Himmler, and designed by and under the direction of August Hirt with Rudolf Brandt and Wolfram Sievers, general manager of the Ahnenerbe, being responsible for procuring and preparing the corpses. Work by Hans-Joachim Lang published in 2004 revealed the identities and family history of all the victims of this project, based on discovery of the prisoner numbers found at Natzweiler-Struthof in records of those vaccinated against typhus at Auschwitz. The list of names has been placed on a memorial at the cemetery where all were buried, at the facility used to murder them, and at the Anatomical Institute where the corpses were found in 1944. Beger conducting anthropometric studies in Sikkim in 1938. The project was designed by August Hirt, who directed the phases that were performed before the end of the war ceased the project prior to its completion. Originally the "specimens" to be used in the collection were to be Jewish commisars in the Red Army captured on the Eastern front by the Wehrmacht. The 86 individuals ultimately chosen for the collection were obtained from among a pool of 115 Jewish inmates at Auschwitz concentration camp in Occupied Poland. They were chosen for their perceived stereotypical racial characteristics. The initial selections and preparations were carried out by SS-Hauptsturmführer Dr. Bruno Beger and Dr. Hans Fleischhacker, who arrived in Auschwitz in the first half of 1943 and finished the preliminary work by June 15, 1943. We have a nearly complete collection of skulls of all races and peoples at our disposal. Only very few specimens of skulls of the Jewish race, however, are available with the result that it is impossible to arrive at precise conclusions from examining them. The war in the East now presents us with the opportunity to overcome this deficiency. By procuring the skulls of the Jewish-Bolshevik Commissars, who represent the prototype of the repulsive, but characteristic subhuman, we have the chance now to obtain a palpable, scientific document. The best, practical method for obtaining and collecting this skull material could be handled by directing the Wehrmacht to turn over alive all captured Jewish-Bolshevik Commissars to the Field Police. They in turn are to be given special directives to inform a certain office at regular intervals of the number and place of detention of these captured Jews and to give them special close attention and care until a special delegate arrives. This special delegate, who will be in charge of securing the "material" has the job of taking a series of previously established photographs, anthropological measurements, and in addition has to determine, as far as possible, the background, date of birth, and other personal data of the prisoner. Following the subsequently induced death of the Jew, whose head should not be damaged, the delegate will separate the head from the body and will forward it to its proper point of destination in a hermetically sealed tin can especially produced for this purpose and filled with a conserving fluid. Having arrived at the laboratory, the comparison tests and anatomical research on the skull, as well as determination of the race membership of pathological features of the skull form, the form and size of the brain, etc., can proceed. The basis of these studies will be the photos, measurements, and other data supplied on the head, and finally the tests of the skull itself. Josef Kramer, photographed in leg irons at Belsen concentration camp before being removed to the POW cage at Celle, 17 April 1945. Ultimately, 87 of the inmates were shipped to Natzweiler-Struthof. These people were kept for about two weeks in Block 13 of the camp so that they might eat well to improve their appearance for the desired casts of their corpses. The deaths of 86 of these inmates were, in the words of Hirt, "induced" in an improvised gassing facility at Natzweiler-Struthof, and their corpses were sent to Strasbourg — 57 men and 29 women. The gassing occurred on August 11, 13, 17, and 19th, conducted by commandant Josef Kramer, who directed the victims to undress, placed the poison in the ventilation, and watched the people fall to their deaths. One victim was shot for fighting to avoid being gassed and thus was not part of the collection. Josef Kramer, acting commandant of Natzweiler-Struthof (who became the commandant at Auschwitz and the last commandant of Bergen Belsen), personally carried out the gassing of the victims, per his testimony at his post-war trial. It is believed that three men died in transport from Auschwitz to Natzweiler-Struthof. The next part of the process for this "collection" was to make anatomical casts of the bodies prior to reducing them to skeletons. With the approach of the Allies in 1944, there was concern over the possibility that the corpses could be discovered, as they had still not been defleshed. In September 1944, Sievers telegrammed Brandt: "The collection can be defleshed and rendered unrecognizable. This, however, would mean that the whole work had been done for nothing-at least in part-and that this singular collection would be lost to science, since it would be impossible to make plaster casts afterwards." Some work had been done at the Anatomical Institute, but the project was never completed. The body casts were not made, and the corpses were not defleshed as skeletons. When the Allies arrived, they found the corpses, some complete and some beheaded, preserved by formalin. Brandt and Sievers were indicted, tried, and convicted in the Doctors' Trial in Nuremberg, and both were hanged in Landsberg Prison on June 2, 1948. 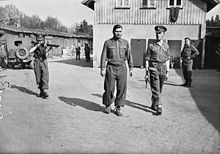 Josef Kramer was convicted of war crimes and hanged in Hamelin prison [de] by British executioner Albert Pierrepoint on December 13, 1945. August Hirt, who conceived the project, was sentenced to death in absentia at the Military War Crimes Trial at Metz on 23 December 1953. It was unknown at the time that Hirt had shot himself in the head on June 2, 1945 near the town of Schluchsee, while hiding in the Black Forest. In 1974, Bruno Beger was convicted by a West German court as an accessory to 86 murders for his role in procuring the victims of the Jewish skeleton collection. He was sentenced to three years imprisonment, the minimum sentence, but did not serve any time in prison. According to his family, Beger died in Königstein im Taunus on October 12, 2009. For many years, only a single victim was positively identified through the efforts of Serge and Beate Klarsfeld: Menachem Taffel (prisoner no. 107969), a Polish born Jew who had been living in Berlin. In 2003, Dr. Hans-Joachim Lang, a German professor at the University of Tübingen, succeeded in identifying all the victims by comparing a list of inmate numbers of the 86 corpses at the Reichs University in Strasbourg, surreptitiously recorded by Hirt's French assistant Henri Henrypierre, with a list of numbers of inmates vaccinated at Auschwitz. The names and biographical information of the victims were published in the book Die Namen der Nummern (The Names of the Numbers). Rachel Gordon and Joachim Zepelin translated the Introduction to the book into English at the web site where the whole book is posted in German, including the biographies of the 86 people. Lang recounts in detail the story of how he determined the identities of the 86 victims gassed for Dr. August Hirt's project of the Jewish skeleton collection. Forty-six of these individuals were originally from Thessaloniki, Greece. The 86 were from eight countries in German-occupied Europe: Austria, Netherlands, France, Germany, Greece, Norway, Belgium, and Poland. In 1951, the remains of the 86 victims were re-interred in one location in the Cronenbourg-Strasbourg Jewish Cemetery. On December 11, 2005, memorial stones engraved with the names of the 86 victims were placed at the cemetery. One is at the site of the mass grave, the other along the wall of the cemetery. Another plaque honoring the victims was placed outside the Anatomy Institute at Strasbourg's University Hospital. On July 9, 2015, French doctor Raphael Toledano discovered at the Forensic Institute's Museum of Strasbourg several tissue samples hidden away, presumed to be from Menachem Taffel. These last remains were buried in the Jewish cemetery of Cronenbourg on September 6, 2015. As journalist and researcher Lang stated, once his long research was published on the identities of the 86 people killed under Hirt's orders, "The perpetrators should not be allowed to have the final word." ^ Bernas, Anne (October 24, 2014). "Un documentaire sur un crime nazi méconnu primé à Waterloo" [A documentary about a misunderstood Nazi crime winning at Waterloo] (in French). RFI les voix du monde. Retrieved March 8, 2016. ^ Lang, Hans-Joachim. "Scientific Murders, Anthroplogists at Auschwitz". 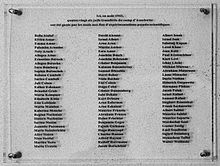 The Names of the Numbers, In Memoriam of 86 Jewish People who Fell Victim to the Nazi Scientists. Retrieved March 11, 2016. ^ a b Bazelon, Emily (6 November 2013). "The Nazi Anatomists: How the corpses of Hitler's victims are still haunting modern science". Slate.com. Retrieved April 4, 2016. ^ a b c Lang, Hans-Joachim (19 August 2004). "Skelette für Straßburg Eines der grausigsten Wissenschaftsverbrechen des "Dritten Reiches" ist endlich aufgeklärt" [Skeletons for Strasbourg: One of the most gruesome crimes of science in the "Third Reich" is finally cleared]. Die Zeit (in German). Retrieved April 3, 2016. ^ "NS-Verbrechen - Die Spur der Skelette" [Nazi crimes - The trail of the skeletons] (in German). Spiegel Online. January 6, 2010. Retrieved October 9, 2012. ^ Lang, Hans-Joachim. "The Perpetrators – Bruno Beger". Die-namen-der-nummern. Retrieved March 10, 2010. ^ Spitz, Vivien (May 25, 2005). Doctors from Hell: the Horrific Account of Nazi Experiments on Humans. Sentient Publications. pp. 232–234. ISBN 978-1-59181-032-2. ^ McDonald, Gabrielle Kirk (March 1, 2000). Substantive and Procedural Aspects of International Criminal Law : The Experience of International and National Courts: Materials (1st ed.). Springer. ISBN 978-90-411-1134-0. ^ Hans-Joachim Lang (August 31, 2004). Die Namen der Nummern: Wie es gelang, die 86 Opfer eines NS-Verbrechens zu identifizieren [The names of the numbers: How it was possible to identify the 86 victims of a Nazi crime] (in German) (hardback ed.). Hoffmann + Campe Vlg GmbH. ISBN 978-3-455-09464-0. ^ Rachel Gordon, translator; Joachim Zepelin, translator (2007). "Die Namen Der Nummern". Berlin. Archived from the original on February 8, 2015. Retrieved 8 February 2015. ^ Toledano, Raphael (2016). "Anatomy in the Third Reich – The Anatomical Institute of the Reichsuniversität Strassburg and the deliveries of dead bodies". Annals of Anatomy. 205: 128–144. doi:10.1016/j.aanat.2016.03.006 – via Elsevier Science Direct. ^ "Remains of Holocaust experiment victims found at French forensic institute". Washington Post. Retrieved 2017-02-08. ^ Lang, Hans-Joachim. "Chronicle - News, July 9 and September 6, 2015". The Names of the Numbers. Tübingen, Germany. Retrieved April 4, 2016. ^ Leeson, Rosanne; Landé, Peter. "Natzweiler Medical Experiments Natzweiler-Strutthof Camp A Small List with a Big Lesson". JewishGen. Retrieved 23 March 2016. Au nom de la race et de la science (In the name of science and race - Strassbourg 1941-1944) on IMDb , documentary directed by Sonia Rolley, Axel and Trancrède Ramonet, duration 55 min. Production France 3 - Temps Noir, April 2013.